Y-DNA testing is a marvelous 21st century genealogical tool that helped me identify my biological paternal ancestry and may - one day - pinpoint my precise ancestral origins. After an autosomal DNA test uncovered a Non-Paternal Event, I quickly moved to confirm my father's ancestry through Y chromosome (Y-DNA) testing. Inherited by men only and passed down from father to son, it's tailor-made for surname research. 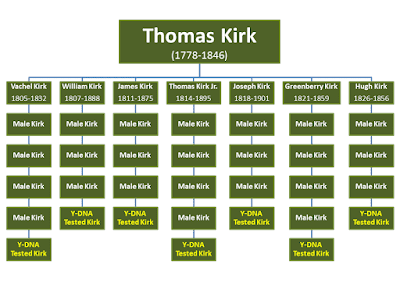 The Y-DNA revealed that I was a Kirk, and traditional genealogy helped identify Thomas Kirk (1778-1846) as my fifth great-grandfather and most distant known paternal ancestor. Thomas was a very prodigious family man with seven sons who each lived to adulthood and had children of their own. Fortunately, each of those sons had direct male descendants who were living and walking the earth today with Thomas' Y-DNA coursing through their veins. Eventually, I connected with each of those living descendants. Eager to help re-create Thomas' unique Y-DNA signature, the men each tested their Y-DNA with Family Tree DNA (FTDNA). The men's common genetic signature or Y-STR markers (Short Tandem Repeats) confirmed that all seven men were closely related. Their collective test results essentially re-created Thomas Kirk's genetic signature without exhuming his remains. That signature would be important in searching for genetic cousins, particularly men living overseas who could help us pinpoint Thomas' ancestral origins. During the course of this testing, I stumbled across a very close match to Thomas Kirk's genetic signature. Curiously, the match didn't share the Kirk surname. Instead, he was a Quirk. The genetic markers suggested this Quirk and all of the tested Kirk men shared a common paternal ancestor. Best of all, unlike the Kirks, this Quirk family could trace their ancestral origins back to the Cashel area of County Tipperary in Ireland. According to the science, the Kirks were, at one time, Quirks who hailed from Ireland's south (spelled Quirke on the Emerald Isle). My curiosity was piqued and I wanted to learn more. What else could Y-DNA testing tell me? Family Tree DNA's Big Y-500 DNA test - a higher level test that's billed as next generation full sequencing - revealed the Y-DNA haplogroup for both the Quirks and Kirks giving an identifying code or name to each surname's specific branch of the Y-DNA haplogroup tree. In the context of my research, the test identified the haplogroup for the Kirk men as R-BY30547. This in itself is fascinating. As citizen scientists, we have identified a branch of mankind's Y-DNA haplogroup tree that represents a mutation specific to my own Kirk clan. But there was more to learn from the test results. Testing revealed that the Kirk haplogroup was a descendant or step down from the haplogroup for the Quirk men (R-BY15517). At some point, a man who was either a Quirk or already a Kirk was born with a SNP mutation, which resulted in a distinguishable genetic difference from his predecessors and was passed on to his descendants including my father. Folks who are better versed in the science of Y-DNA have worked to establish age ranges for the mutations of each step of the haplogroup tree. The ranges are broad and expansive, but perhaps the science will continue to get better and these dates will narrow. In support of my research, four men have completed the Big Y test. A US-based Quirk who traces his paternal ancestry back to a Michael Quirke of County Tipperary, Ireland. Two US-based Kirks who descend from Thomas Kirk, my fifth great-grandfather. A US-based Kirk who descends from a Vachel Kirk that I speculate was a brother to the above-mentioned Thomas. 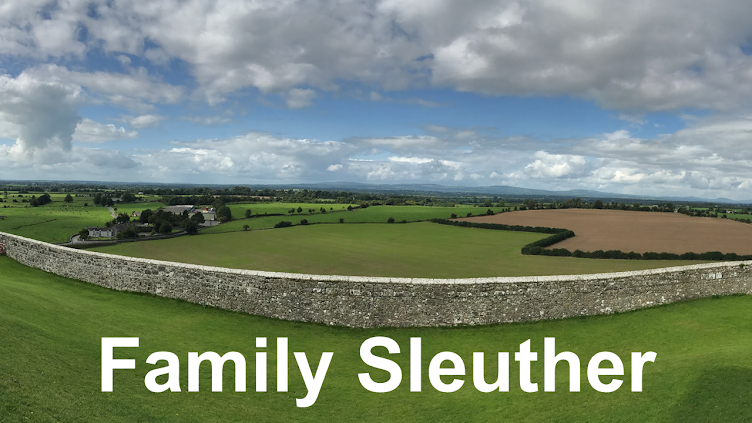 My next research step is to test a male Quirke from Cashel to help us confirm our ancestral origins were indeed from southern Ireland. With that confirmation, research efforts could then focus on the Quirke family's genealogy and see if it's possible to identify when the Kirk clan split off - genetically and for America. Interesting---I am not at all versed in Y-DNA, but am now using my brother's results to trace our Cohen roots. The science, however, is beyond me! I don't feel particularly well versed either. In fact, I write about it so I can gather my thoughts in one place to serve as a reminder of what's what, and help me navigate what it all means. I'm excited that you've tested your brother and are ready to dive into those results. I will keep you posted---still waiting for the results!